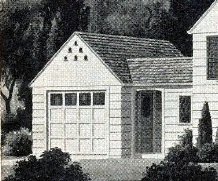 Sears encouraged customization of their standard kit houses. "Your ideas and suggestions--what you want--are welcomed and made practical at a price you can easily afford." Typical customizations would be to reverse the floor plan, modify closet configurations, add a sun room off the side, or make a house a few feet wider. Sometimes Sears would combine the exterior facade of one model with the interior floor plan of another. 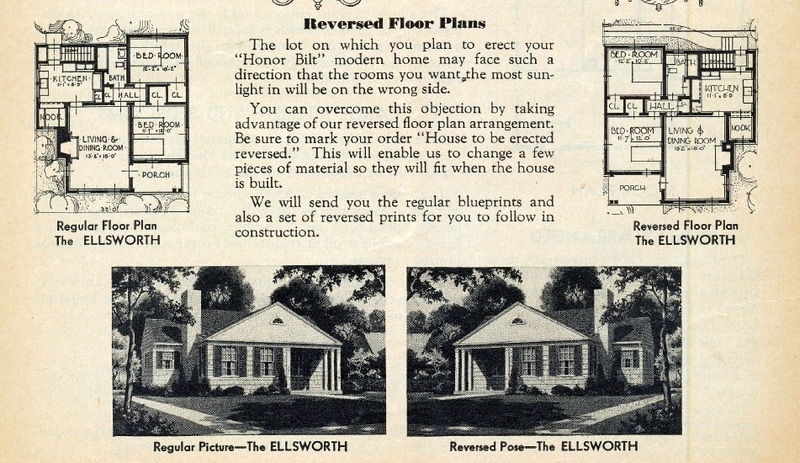 The Sears catalog says that reversing a floor plan is no big deal. Based on the customer's requirements, Sears staff architects would customize the standard plans and maximize the usage of standard sizes of materials and millwork so that the customer would save on the cost of building materials. The lumber arrived to the customer pre-cut based on the custom specifications. There is a house in Mount Prospect I have driven by for years. I always looked at it and thought it resembled some Sears models, but it was too big and not quite a match to any of them. Now I can say with reasonable certainty that it is a customized Sears house--a hybrid of two models. 300 W. Milburn, Mount Prospect. The main house is a stretched Sears Concord. Sears Concord from the 1940 catalog. Here's the whole house. The garage and breezeway that attach to the main house are from the Sears Homecrest. 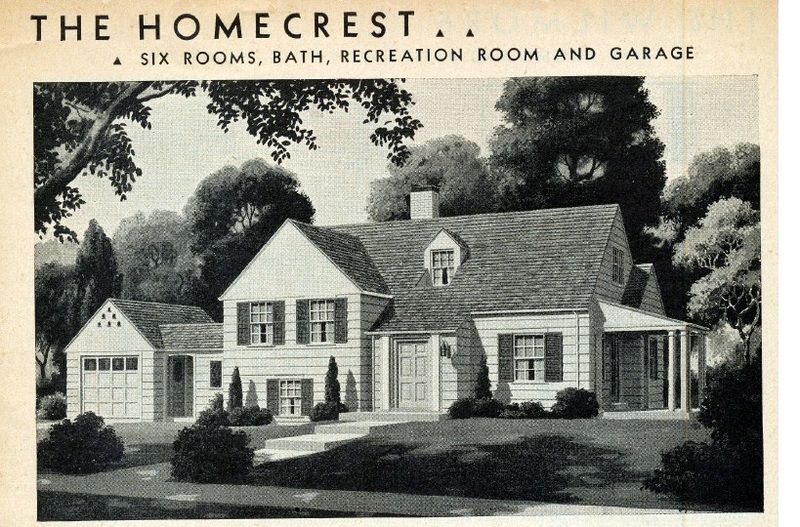 Sears Homecrest from the 1938 catalog. Closeup of the garage component of the Homecrest. An exact match! The side of the house. It has some original Sears components like the roof vent and the arched window. The Concord in Mount Prospect does not have the side patio (it was optional and easy to omit if a customer had a smaller lot). The building permit for this hybrid Sears house was dated December 1933. The Sears Concord was first sold in 1933 and the Homecrest was first sold in fall 1933 (when the 1934 catalog came out). It is within reason that this house could have standardized components from both the Concord and the Homecrest. The Mount Prospect Historical Society has a note in its files that the house was originally from Sears Roebuck (Meta Bittner, one of the original owners of the house, was a co-founder and the first president of the Mount Prospect Historical Society). Meta was married to Victor F. Bittner. Victor worked as a technical engineer for Peoples Gas, Light & Coke Company in Chicago. The Bittners moved from Chicago to Mount Prospect in 1931 and rented an apartment on Main Street. "This was a radical change that we made. We had no friends. Meta cried. She could not speak German. The next-door neighbor could speak no English. Most of the communication in the business establishments were in German. Going three blocks in and direction from the business area, you'd see nothing except sidewalks and paved streets, no buildings.... And there was only one church in town. That was St. Paul's Church. And all the services were held in German except one was held, once a month on a Sunday evening, that was held in English. People were kind to us and soon we were treated just like natives..."
"The Depression came along, everything stopped. The year I built this house, there were only two homes built in this town. And it took a lot of nerve to get the building started. " This statement from Victor supports the claim that the house is from Sears. In 1932, the year before the Bittners bought their kit house, Sears reported that they were responsible for 52.5% of houses sold in the 45 major metro areas in Illinois (there are 45 metro areas?). 218 houses were built in Illinois; Sears sold 115 of them. In other words, if a house (like our Concord) was built in Illinois during the slump in residential building (1932-1935), there is a good chance it was from Sears because Sears was a company that people trusted to deliver in an economic collapse. "And Milburn and Elmhurst was our home. We moved into it in 1934. As we moved here, there were only two buildings in this area. Everything was wide open. We had vacant land all around. In the later years, we’d lost our loved wide-open space for the construction one-by-one of house after house. And finally we were completely surrounded with buildings." The Bittners owned the house until at least 1975.